Sometimes you discover an idea that you wish you’d thought of first. Chocolate chip cookie shot glasses? Guacamole grilled cheese sandwiches? Cake pops? All brilliant, but they’re sadly the brainchild (brainchildren?) of other people. And how about little single-serving quiche made in bread bowls? Not my idea, but I love them just the same! I saw them on some random blog back in the day. I adore the idea of miniature food and single serving snacks (for years, I’ve loved the Hors d’Oeuvres Handbook by Martha Stewart, mostly for the pictures inside!). 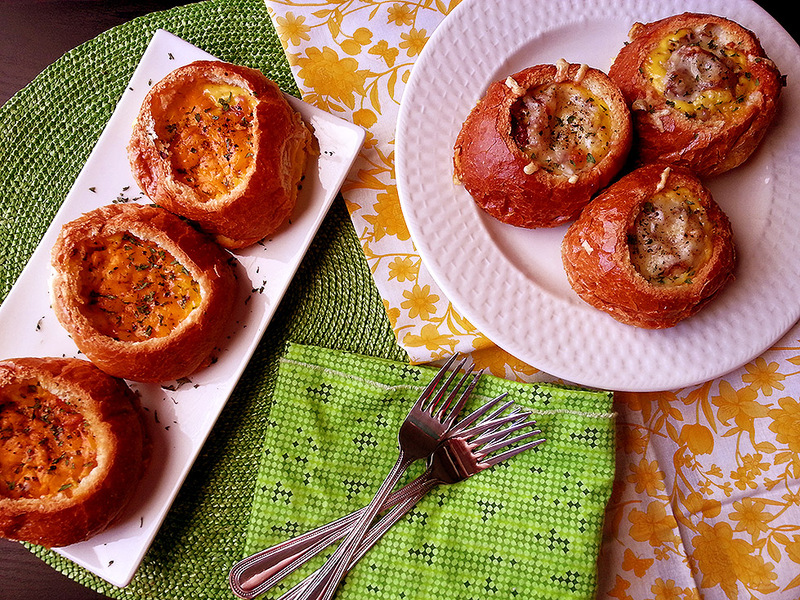 Instead of serving a whole gigantic quiche to your breakfast or brunch guests, why not create individual versions stuffed with all their favorite quiche fillings, adorably crammed into little bread bowls? Tell ’em the idea was yours alone. I won’t be bummed if you take the credit — they’re just too cute!